Third-grade students participating in the Adrian Scholars and Rubies program visited Notre Dame College on Thursday, March 21st. Approximately twenty-four students, along with club advisors Sylvia Marshall and Bridgette Abbot visited the local college for an after-school tour of the campus. 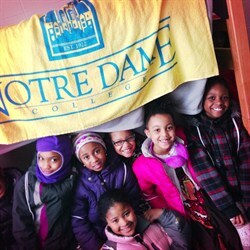 The visit to Notre Dame College provided students the opportunity to apply and discuss key concepts and skills they have learned in the Scholars and Rubies program in a real-life setting. The unique program is designed for third-grade students and includes two sections, Scholars (boys) and Rubies (girls). The main purpose of the Scholars and Rubies program is to encourage students to strive for academic excellence, and provide guidance in preparing them for future academic and career goals. Congratulations to the Adrian Scholars and Adrian Rubies for their hard work and dedication to academic achievement!